A cab operated by Freedom Taxi waits in a line of traffic on the JFK Boulevard Bridge near 30th Street Station in Philadelphia. 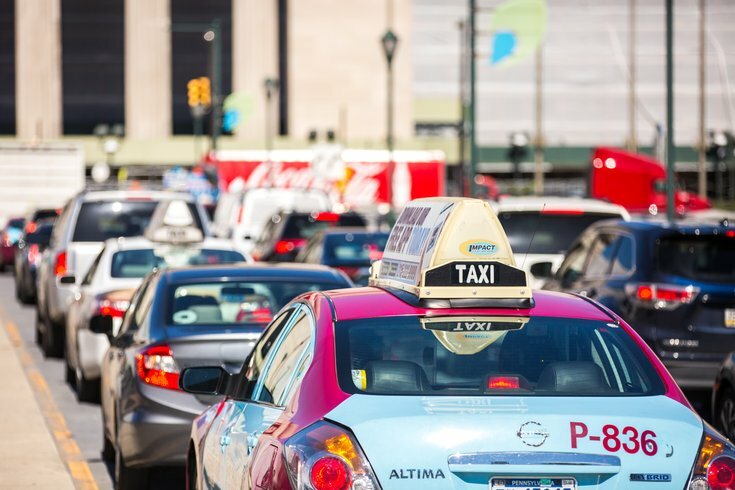 Late last year, Philadelphia’s taxi companies, once in opposition with one another, announced they would join forces to stay relevant against ride share apps luring riders away from traditional cabs. In an effort to modernize, a great number of 215-Get-a-Cab cars also installed new touchscreen tablets, using GPS to help riders navigate the trip, not unlike what you’d find in an Uber or Lyft app. There’s at least once major hiccup in the upgrades, though: increased theft. Billy Penn reported almost $4,000 has been spent to replace tablets stolen from 215-Get-a-Cab cars, with the company already racking up 10 cases of theft. Installation of the tablets in vehicles began last October, and they cost, on average, about $350 each. There's perhaps some karma in balance, however. Ironically for thieves, the tablets have virtually no value outside of the cab. Each tablet is encrypted with software that makes the devices useless for anyone but a cab driver, and even at pawnshops or online resell, the tablets are vastly devalued because of the software encryption. There are reportedly 600 tablets in use throughout 215-Get-a-Cab taxis. As a result of the robberies, drivers are being told to remove the tablets when cabs are not in use. In cab companies’ efforts to stay competitive, another recent upgrade included the rollout of an updated app, allowing riders to hail a cab using their phones.